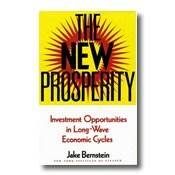 Long wave economic cycles - The New Prosperity focuses on how to actually implement a practical and realistic investment program for the collapse-and-renewal forecast for the near future. Long wave economic cycles. The New Prosperity focuses on how to actually implement a practical and realistic investment program for the collapse-and-renewal forecast for the near future. Specific market projections for precious metals, stocks, and interest rates based on various long-range scenarios. Illustrated.